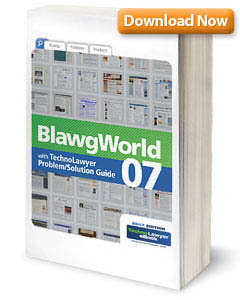 BlawgWorld 2007 features a remarkable collection of essays from the legal blogosphere and the 2007 TechnoLawyer Problem/Solution Guide offers a new way for law firms to find answers to management and technology questions. BlawgWorld 2007 enables lawyers to find legal blogs of interest fast. More than 120,000 blogs launch every day, many of them in the legal sector. Lawyers clearly do not have the time to read every legal blog (blawg). But many blawgs contain excellent content pertaining to their practice of law. The first edition of BlawgWorld, release in November 2005, was downloaded more than 45,000 times. The second edition is expected to have an even larger audience because of its wider distribution . . .
Fifty percent larger than its predecessor, BlawgWorld 2007 contains thought-provoking essays from 77 of the most influential blawgs. Handpicked by each respective blogger, the essays provide a window into their blawgs, making it easy for lawyers to figure out which ones merit their personal ongoing attention. Follow these links for more information: a complete copy of BlawgWorld 2007; the full TechnoLawyer press release. 1. "BlawgWorld 2006: A Book About Law-Related Weblogs from TechnoLawyer"
2. "BlawgWorld 2006 Now Available for Free Download." THE WEEKLY LAW SCHOOL ROUNDUP . . . The Weekly Law School Roundup alternates between Legal Underground and divine angst, where Kristine has posted this week's Weekly Law School Roundup #80. The next installment will appear here in about a week, so be sure to check back. AT MY TRIAL PRACTICE WEBSITE . . . "Improve Your Google Searches." AT MY TRIAL PRACTICE WEBSITE . . . "Tips on Opening Statement from David Ball." BLAWG REVIEW #118 . . . This week's edition of Blawg Review is at Blawgletter, written by Barry Barnett. To find out who's hosting next week or to learn how to get your weblog posts reviewed, see the Blawg Review website. AT MY TRIAL PRACTICE WEBSITE . . . "The E-Discovery Archives at the Richmond Journal of Law & Technology." How to rise to the top of a law firm. All the Machiavellian Lawyer posts can be found here.